Zorua!! Why you are so late to post this?! 1 – Mission: Engaging Kaiser with crowd. Desert Data. The rest of the Episode 2 and Episode 3 will be up and running in Grand Opening of SDGN. You will be able to see some new environment and meeting new enemies. GM Halo have bring us 2 part of gameplay video about this mission. Zorua’s note: When the special skill is used, it turn on the GN Field, unlike general special move. 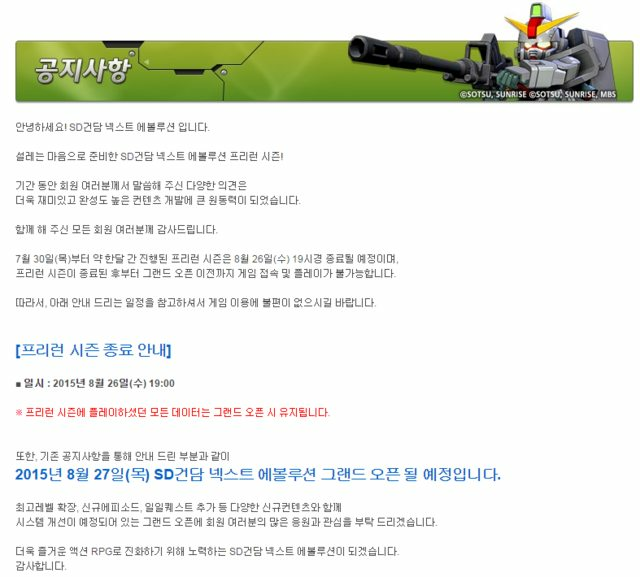 So it is expected to have more and more special move for new units. 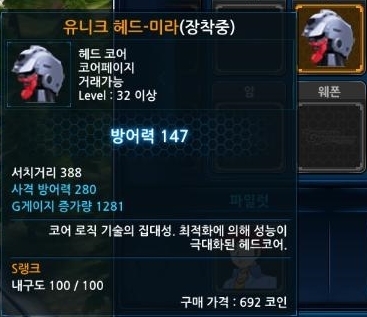 Moreover, when the unit fall to certain amount of HP left, it transformed into another mode, and all skills are changed. The 4th skill (Trans-Am) seems to be unuseable before hit goes into 2nd mode. Kaiser is ready to accept your challenge at any time. Try Challenge now! New quests are added accordingly. Completing new quests rewarding you variety of materials and more units rewards. New purple exclamation mark [!] show you that there are new daily quest from this NPC. Daily quest vary everyday of the week, rewarding you different compensations. You can only complete the daily quests once per day. 25 level to 35 level. 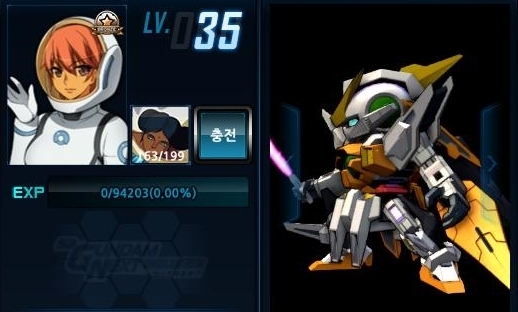 There will also be new cores(parts) for higher levels. Zorua’s whining: It’s stat close to my current head cores… I guess this core is a low roll on RNG stats. There is only 12 units are released in Pre Run period of the game. In August 27, there will be many new units added into game. 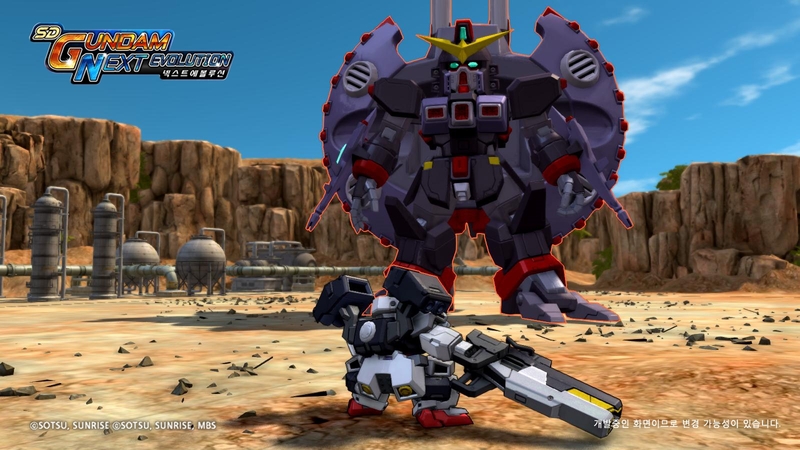 Many popular Gundam OO series units will be release e.g. Gundam Kyrios, Gundam Dynames and Gundam Virtue. EXTRA attack can only be trigger after the motion of basic attack ended. 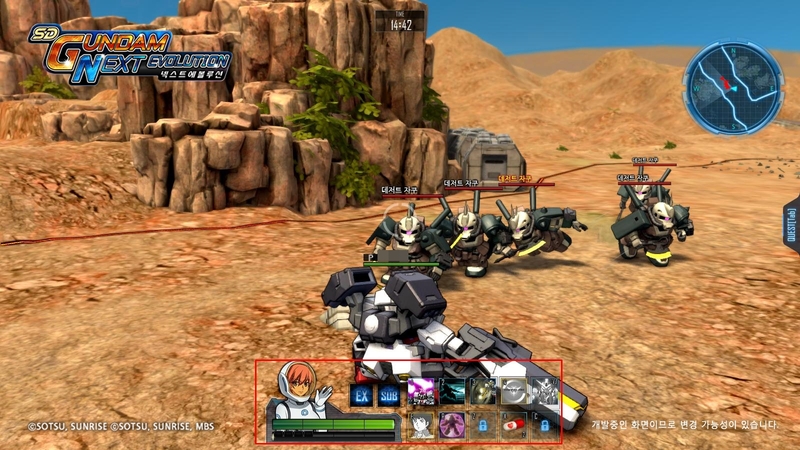 EXTRA attack will trigger right away when used and cancel the previous basic attack(launching attack)’s motion. When skill chain, the previous skill motion have to end before the next skill is activated. When skill chain, the previous skill’s motion will be cancelled right away and follow up with the next skill activation. Now you can use laboratory to build up your own cores from blueprint. In Grand Opening, UI had changed drastically. 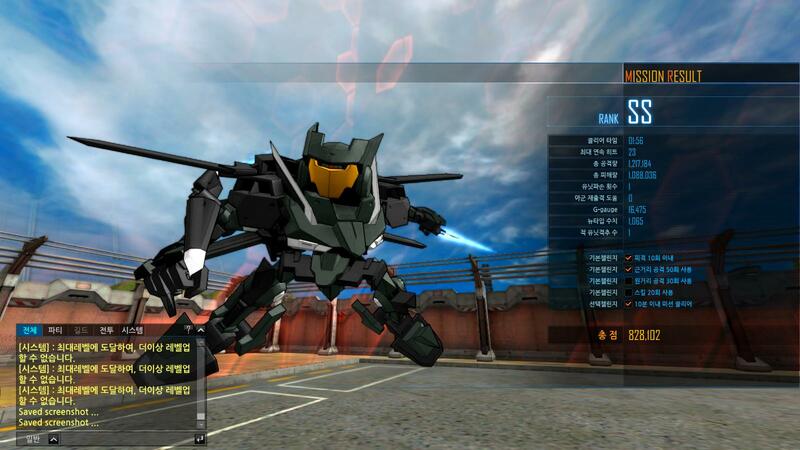 ① Avatar: The avatar when you set in your character creation will be shown here. ② HP Bar / Pilot Gauge: Unlike traditional light colors shown, you can quickly check their status in the appropriate placement. ③ EX/SUB: Now you can check your EXTRA attack’s and secondary attack’s cool down here. ④ Skill and Item Bars: It is becoming more compact and shorten compare to old long skillbar. Everything can bee check in a glance. UI is improve and more combat focus. That’s all folks. GL in your battlefield. 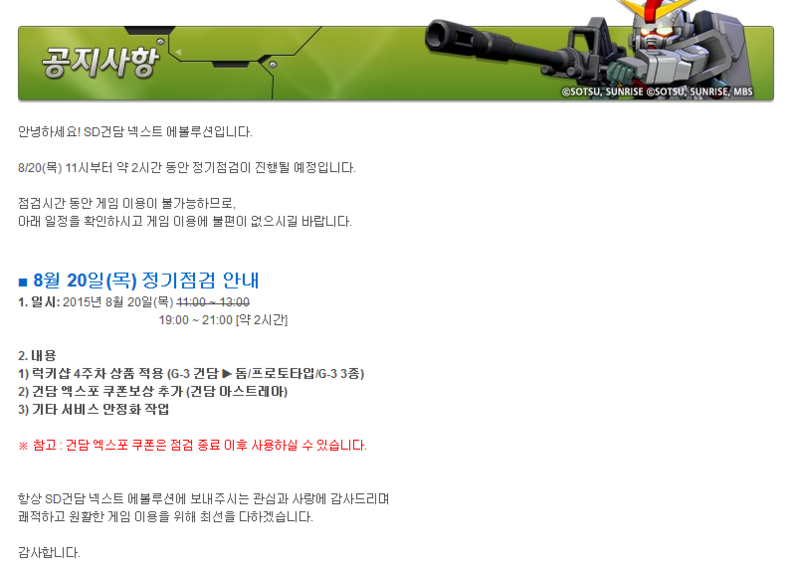 SDGN Free Run will be shut down at 26 August 2015 19:00 (Korean time, GMT+9). Of course, all player data will be retain. Playing the game before the Grand Opening and after this time is not possible. SDGN Grand Opening will be up in 27 August 2015. 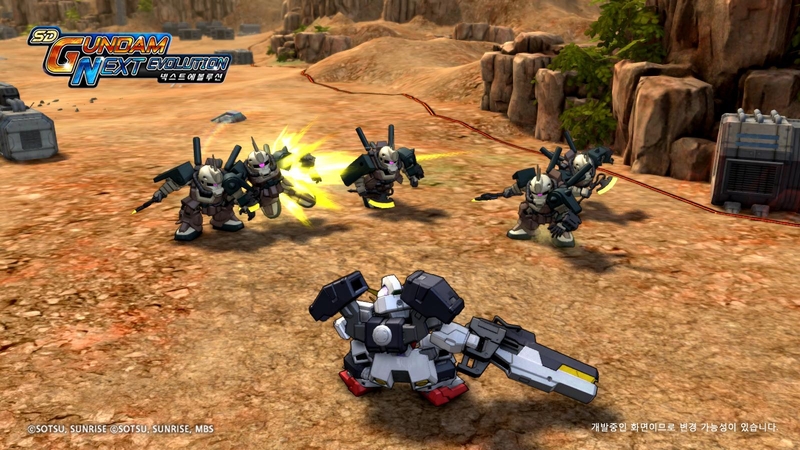 SD Gundam NEXT EVOLUTION is aiming to be a more enjoyable action MMORPG. Zorua’s whining: Where is the freaking PvP confirmation?! 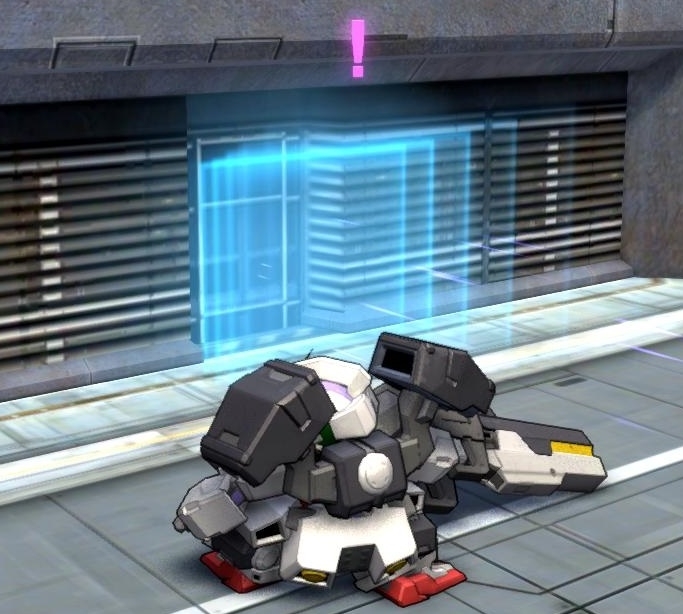 When my friend and I were discussing about units and how there were so many Ground Type Gundam in early FREE RUN period, I found out that the skill description of Ground Type Gundam is far off from what I remembered weeks ago. When I check the wiki, I got wrong data on it. What it actually is in game. Gotta fix the wiki anyway. I wonder if it is nerfed? If it is, it’s a big one. Anyway, there are two tips for you guys today. Firstly, if you may notice, the max inventory space is around 100. Anything you receive more than that in mission will goes into your mailbox. Moreover, if your inventory have not enough spaces, you cannot receive your mail. There are actually some mission drops that you don’t have to keep. The price of selling these items is exactly the same as buying them. They are only used when you need to build up an MS from blueprint. Remember, some of them couldn’t be bought from shop, so it is better to keep them. 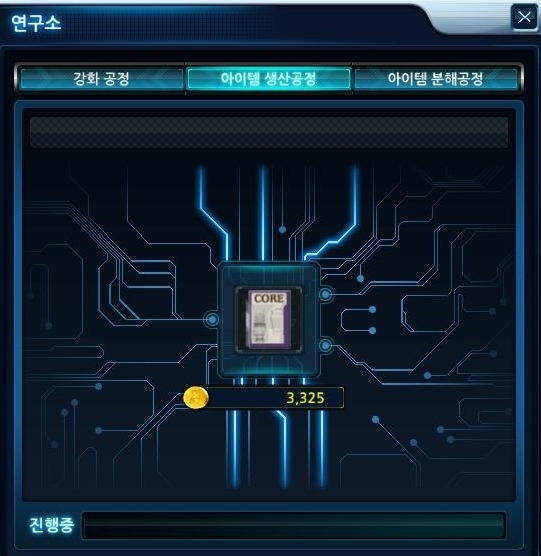 And if you did not notice, if you accidentally sell something that you shouldn’t, you can buy back at the same price before you go to any mission or logout of the game. While for second tip, it is regarding to waves based missions like EX1-5 and EX2-1. In short, you do not have to clear all the waves in order to clear the mission. All you have to do it survive and timeout the mission. Plus, there is a bug where you will be invincible after you survive the time out of the mission, yet the enemy still spawning. They may not drop anything, but you can use this bug to clear your EX2-1 related quest. I wonder if that is said to be exploiting the bugs, but I digress. That’s all folks, see you guys later. Ever wonder how the score works? Everytime when you finish a mission, the score seems to be lower when you did perfect without taking damage. However, the score is mysteriously high when you did well… not that great. My friend and I had tried to figure out how the score works. So we collected a bunch of gameplay results, ending up with this comparison. These result is taken from Mission 1-11 by Wing. In first result, Wing receive no damage at all and then kill the boss. Faster, higher combo and higher damage output. However, in second result, Wing had ate a “kamikaze battleship”. One of it is enough to deal around 1 million damage over kill on him. With that, the G gauge generation is much higher as well. And then, he had a much higher score despite the time, combo and damage output. We had already sort of figure out how clear time is the most decisive factor on score. However, without max combo or damage receive which too greatly help on gaining G Gauge, it is very hard to get a SS rank score. Is not impossible, but much harder. Which player might have to intentionally create some scenario that allow high combo numbers to be done. Also, party mates have to prevent themselves to attack the enemy that the score runner is attacking in order to let him/her building up his/her combo? Or even going try hard support mode to pull the enemy from far away to this player so he can continue his combo?! Party mates gotta help to speed up the run without dealing too much of damage??? I could be wrong on my assumption of how score is calculate. However, if it is true, it actually kind of encouraging bad plays to get for higher ranking rather than pro plays without taking any damage. Sorry for doing unnecessary whining about irrelevant stuffs, but now you know how to theoretically rush for ranking, right? Go prove me right or wrong by getting some ranking in missions. The grand opening schedule has been confirmed. Episode 2 and 3 missions will be published. 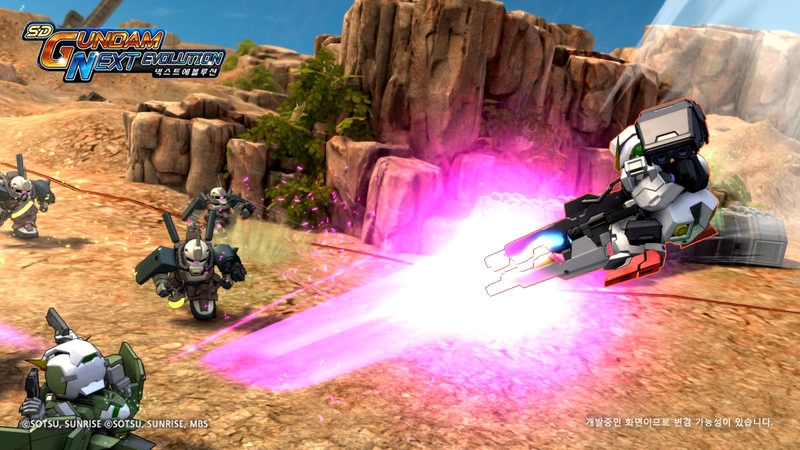 Particular Episode 3 last mission [Engage Destroyer Gundam] will be a thrilling battle. 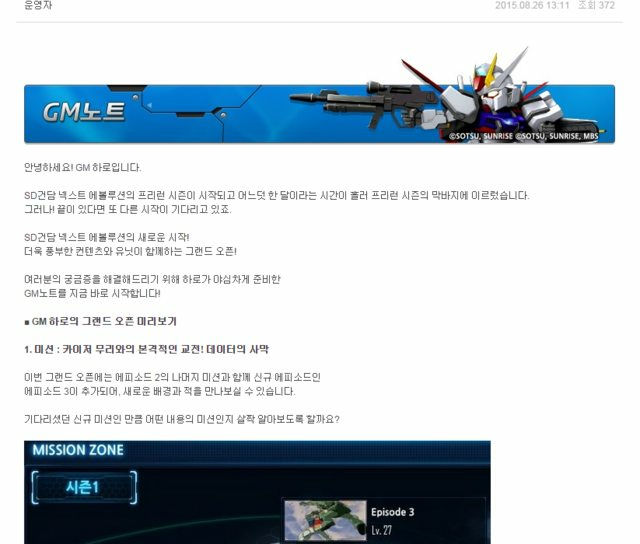 They’re also pinging gundam dynames and kyrios as new units. New action cancelling system in combat is added to speed up the pace of battle. The specific hour of opening will be confirm later. All pre-run data will be remained. Good morning. 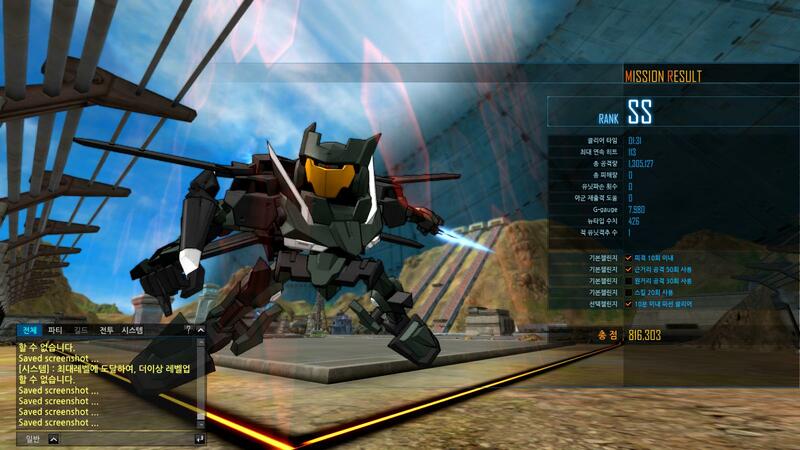 It is SD Gundam Next Generation. 20 August 2015 (Thu)’s 19:00 – 21:00 (Korea Time 7pm to 9pm) will be scheduling for 2 hours. Within the two hours, the game will not be playable, so sorry for inconvenience. Lucky Shop have changed its unit again. This time, you are allowed to get all three previous special units. 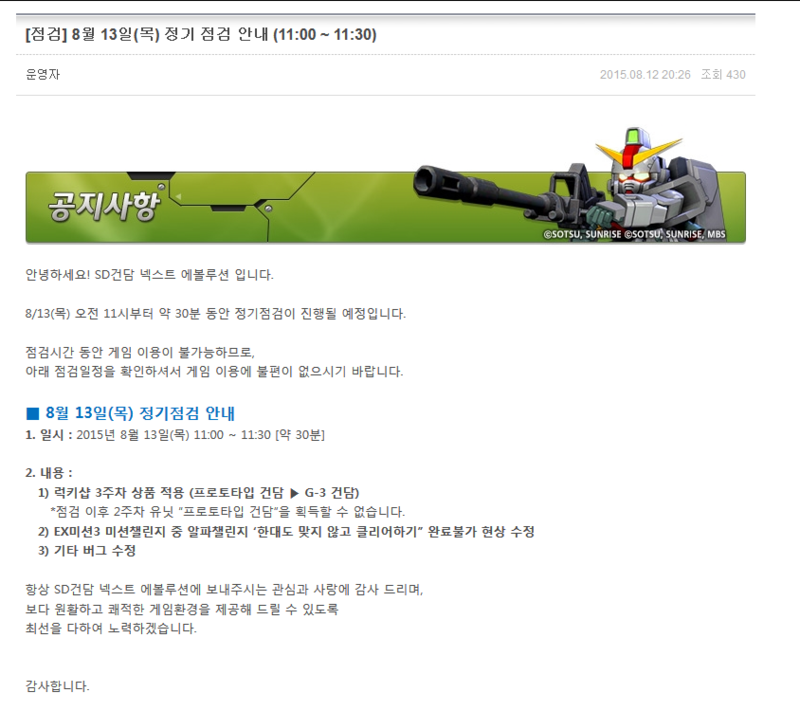 Additional compensation coupon for people who participating in Gundam Expo Korea. This is a live event happening in Korea. 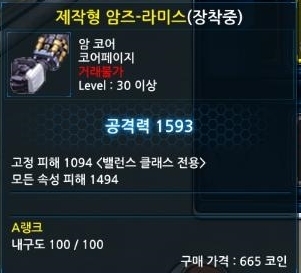 You can get 15 stamps in Gundam Expo to exchange for a Gundam Astraea unit in game. 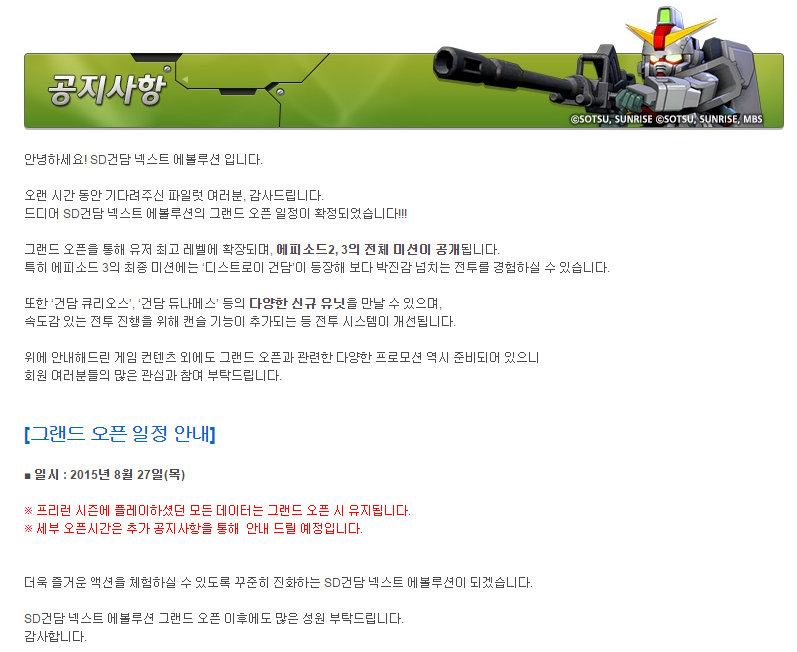 Note: Additional Compensation coupon taken from Gundam Expo Korea is usable right after this maintenance complete. Thank you for always giving love and attention to SD Gundam Next Evolution. Please do look forward to a smooth game playing.